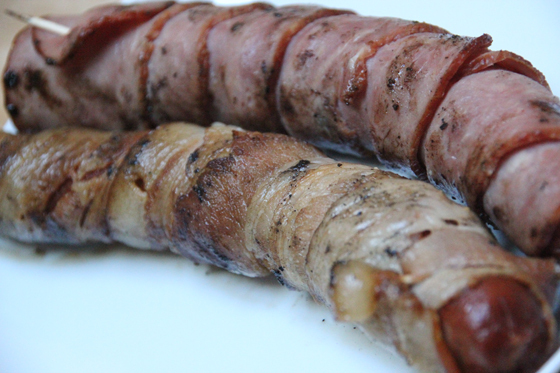 Have you ever eaten a bacon-wrapped hot dog? The trend actually comes from a culinary creation in Mexico that started in the 1950’s, and appeared in San Francisco’s Mission district quite a while ago, brought courtesy of propane tanks and makeshift flattop grilling apparatuses that aren’t exactly legal, but get the job done beautifully. When you get them in the Mission, they’re usually topped grilled onions and jalapenos – YUM. 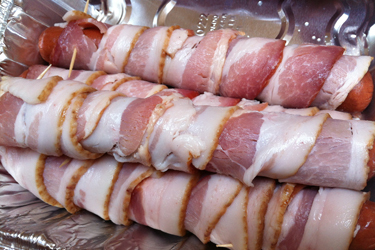 Today, we were having a barbecue and we wanted to serve up some bacon-wrapped goodness of our own. We weren’t going to do the full-on Mission style serving, but wanted to present the basic, bacon wrapped hot dog in its pure beauty. 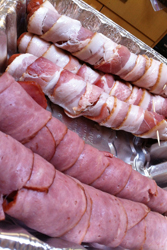 Basically, there’s not much to a bacon-wrapped hot dog – choose some substantial, quality hotdogs (we got some hefty Costco franks and all-beef polish sausages – the kind they sell for you to eat right there. DELICIOUS), and get some nice bacon. We didn’t want our bacon too thin or too thick – too thin, and your bacon showing is poor, too thick, and you have to use almost a whole package of bacon just to cover one dog. It was a little bit of a challenge finding the right stuff. If you have a hard time finding the best bacon, I’d just err on the thinner side and get double the amount. You can really never have too much bacon. All you have to do is begin at one end of the dog and wrap the bacon, a bit on itself in every wrap-around, and go all the way up the dog. We used a toothpick at the top to secure the bacon. Our good friend Mike joined us, and since he eats kosher, we made him a special treat – the same all-beef dog, with turkey bacon wrapped around. Yeah, yeah, turkey bacon may not be exactly the same thing, but it’s still pretty darn tasty. Then we threw them on the grill. As the bacon cooks, it keeps its shape around the dog and the toothpick at the top can be discarded after it’s done. 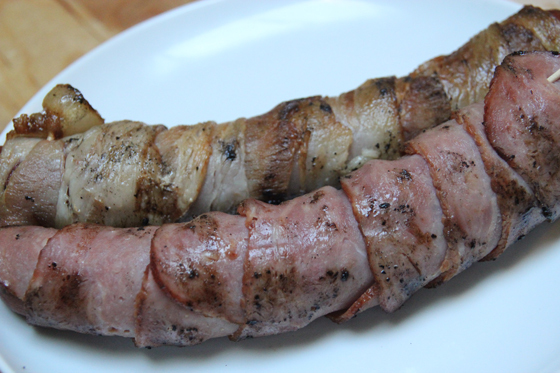 We grilled the dogs until the bacon was cooked through (the dogs are already fully-c0oked – this is probably the best way to ensure everything’s done but not overdone when doing this), and voila – bacon-wrapped deliciousness. Okay, so we didn’t have these hot dogs at the ballpark like the quote I chose above, but Bogey would have agreed that a bacon-wrapped hot dog with great friends is better than pretty much anything.